The aim of this ranking is to provide the result of online survey regarding the current condition and policies related to Green Campus and Sustainability in the Universities all over the world. It is expected that by drawing the attention of university leaders and stake holders, more attention will be given to combating global climate change, energy and water conservation, waste recycling, and green transportation. Such activities will require change of behavior and providing more attention to sustainability of the environment, as well as economic and social problem related to the sustainability. We believe that the universities that are leading the way in this regard need to be identifiable and so we have decided to make a start in doing this. Initially, we will collect numeric data from thousands of universities world wide and process the data provided to arrive at a single score that reflects the efforts being made by the institution to implement environmentally friendly and sustainable policies and programs. Universities will be ranked according to this score. We hope that the rankings will be useful to university leaders in their efforts to put in place eco-friendly policies and manage behavioral change among the academic community at their respective institutions. We selected criteria that are generally thought to be of importance by universities concerned with sustainability. These include the collection of a basic profile of the size of the university and its zoning profile, whether urban, suburban, rural. Beyond this we want to see the degree of green space. The next category of information concerns electricity consumption because of its link to our carbon footprint. Then we want to know about transport, water usage, waste management and so on. 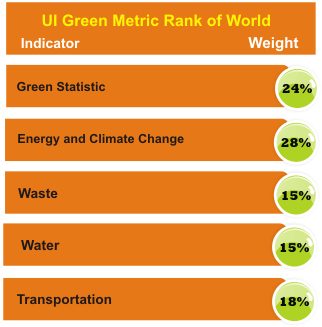 Beyond these indicators, we want to get a picture about how the university is responding to or dealing with the issue of sustainability through policies, actions, and communication. Overall a good result for UK institutions and Nottingham in particular (as well as for Bradford and Plymouth in the top 10 and Bath in 15th and Bangor in 19th place). The number of institutions participating this year has again increased and it does rather look as if this league table is becoming more established.